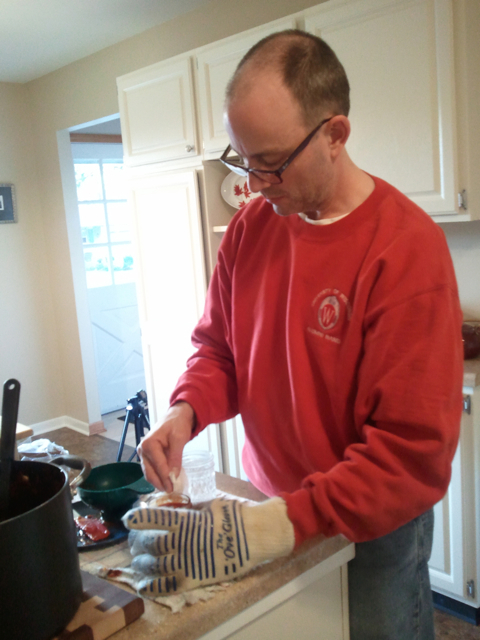 After an exhausting yet exhilarating day of canning salsa, I sat at the dinner table and announced to Jay, "I think I'm becoming my mother's son." Plumb, roma and pink beauty tomatoes: shelf life - 1 week on the counter, 2 in the fridge. "Watch your grammar" he replied, "You're using a gerund." He's right, I should have said "I AM my mother's son." 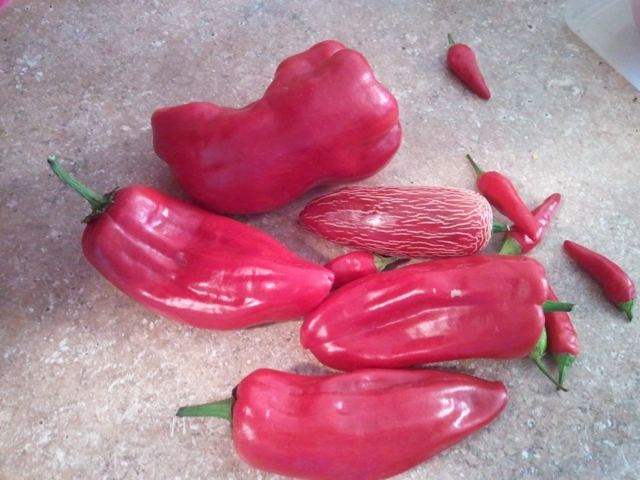 Jalapeno, chile and some sweet peppers for the salsa: shelf life - several weeks fresh, several years dehydrated. 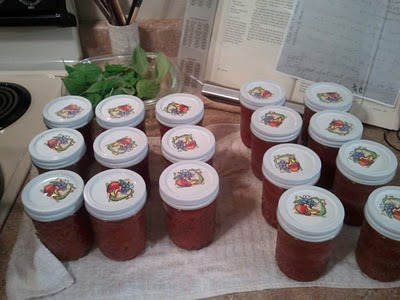 I was practically giddy after cooking and canning 18 8-ounce jars of home made salsa. My elation was fueled in part by seeing the culmination of all our gardening work preserved beyond the brief shelf life of a fresh tomato. It's also fueled by the joy (and challenges) Jay and I had working together (there was a tense moment among pots of boiling water, bubbling salsa and sterile jars and lids when both of us didn't know what to do next; thank goodness for YouTube videos.) Finally, it's fueled by a strong memory from 30 years ago of my mom stepping back from her pantry after a marathon week of canning and saying to one in particular and all of us at the same time "Well, if we have nothing else, at least we'll have tomatoes." It was an indelible memory that if the economy or our food supply ends as we know it, it's still possible to preserve food for later consumption. 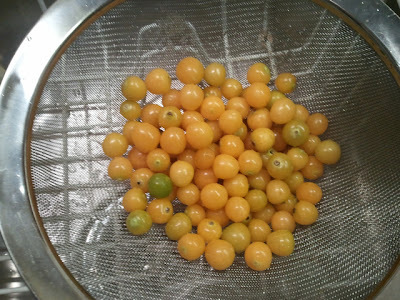 Ground cherries, plump sweet little things: shelf life - several weeks in husk, a week once shucked. For our family living on, and for awhile exclusively supported by, a small pig farm, food security was a reality that my mom managed by preserving food from the garden and what we wild-picked in the fields and forests. And while food security is not a current issue for Jay and me, there was still something very satisfying about taking food we had grown, cooking it and knowing that it'll be there in those jars when we want to eat it. So knowing all that, you may begin to appreciate why it was a such a big deal to me that this weekend Jay and I worked together to preserve what could be the last batch of fresh tomatoes from our community garden. (I say "could be" because who knows when frost will kill the plants). 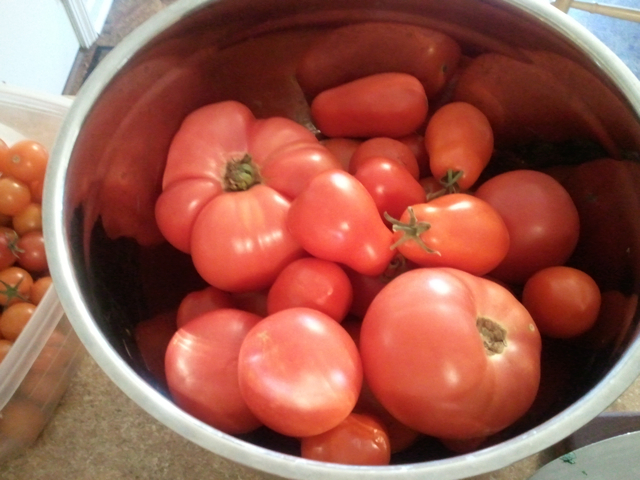 We decided to make home made salsa using our own tomatoes following a recipe my mom uses and got from a family friend. I followed the recipe with few alterations (used honey instead of sugar, and my own seasoning instead of a "taco seasoning" packet.) I know that canning is serious stuff because of the very real possibility of food poisoning, though it's more likely a jar gone bad will explode in the basement before we eat something that could kill us. Jay was very careful to keep the jars and lids clean as we filled and capped them. I hope I did a good enough job on the second batch I made by myself. Fruits, err, salsa of our labor. 18 8-ounce jars of home made salsa. On Sunday, Jay departed for a work trip and I was faced with more tomatoes in the fridge (I know, I know, but they were threatening to go bad, and it was the only way to fend off the fruit flies). So, I took what we learned together and did what I suspect my mom did every summer, prepped, chopped, cooked, canned and processed salsa on my own. Four hands certainly did make the job go faster, but I managed not to burn myself or anything else. Bought pint jars for the second batch. I didn't want to make an identical batch of salsa, so I added seven tomatillos and kernels from three ears of corn (had to buy those). I also roasted some of my own peppers on the grill- I love the smokey flavor of chipotle. Blackened the skins of some sweet red bell peppers, two yellow peppers and a few "sweet carmen" peppers, let them cool and peeled the flesh off the burnt skin. About the sweet carmen, there was nothing much left of the flesh after cooking them, they didn't burn away, but the flesh seemed to simply disappear. The second batch made 11 pints of salsa (recipe said it woud be seven but I added all that stuff). Not knowing much about canning, I just hope the lids don't start to buldge because my proportions were off - I'll check them every few days to see if anything looks like it's going bad. I'm very interested to hear your canning successes (and failures if you'd care to share). Darlings! You should have called me. No need for Youtube when you have this old farm wife around. The canning bug bites hard and doesn't let go easily! I would suggest you get the extension's excellent resource for canning. Lots of recipes. One caution, approved recipes are important. With high acidity (like salsa) you won't have a problem with botulism but you might have a problem with spoilage if you add too many ingredients. It's all a choice, of course, but I only use the extension tested recipes. It's just too much work to have a whole batch go south. I'm glad you had fun. Maybe we could can some apple butter later in the season! Ok, so now I'm worried about the tomatillos and corn I added to the second batch. How will I know if they've gone south? Now wondering if I should fridge all the jars and eat them right away... Advice from the old farm wife? My mom made pear preserves forever it seems. I had a copy of her recipes from after she passed away (along with an "extension service brochure" from long ago she had in her file). So when I came across some pears on an old farm where I hunted with friends, I decided to give them a try. So glad I did. It was like being a kid again! 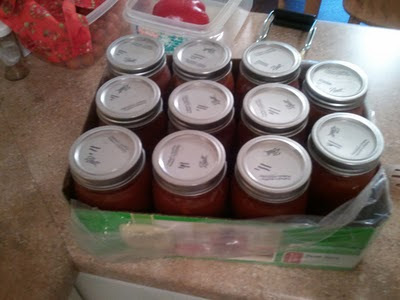 I've got lots of canning stories, but what I want to tell you about is what I do with the tomatoes that I am just too tired to can after so many jars. Dry them, and then make them into pesto. Cut them in half, or quarters, place them on a wire rack on a cookie sheet, salt them, spray them with a mister filled with vinegar (optional), and then put them in a 150-175 oven for 6-14 hours (depending on how juicy they are to begin with, and how dry you want them). I usually go til they are still a little moist, but sticky and semi-dry. Then you can grind them up in a food processor with some toasted pine nuts, grated parmesan, a bunch of garlic, and olive oil til they are a paste. I add a bit of water to loosen it up if it's too dry, and to avoid it getting too oily. Salt to taste, then freeze in cubes. Pull it out in the winter and toss with pasta. I think I like it better than basil pesto.